USAC Southwest Sprint Car series returns Saturday night May 19th for the 8th annual Robert Horne Ford night at the races. Last time to the speedway, Tye Mihocko was the first to cross the checkers with a last lap pass on Charles Davis Jr to pick up his first USAC Series win . Only 49 points behind the leader Charles Davis Jr, Mihocko will try and build momentum from the victory as the series nears the half way point of 2018. Coming into Saturday night, multi time winner Charles Davis Jr leads the Southwest division with Mihocko, Mike Martin, Michael Curtis and Josh Pelkey rounding out the top 5. IMCA Sport Mods also in action along with Modlites and Robert Horne Ford Bombers. Sport Mods action continues to thrive at Arizona Speedway and has Chase Alves with three wins on the season on top off the standings 11 points ahead of both Jason George, who holds one 2018 feature win and Mark Harrison. With a stacked field of teams, standing in the winners circle will be no small feat this Saturday night. Sean Conyers and Dave Lems hold the top two spots in Modlite standings with former champ Brendon Priest in third. Priest was the winner of the last meet to the speedway with a thriller involving Priest, Steve Moriarty, Conyers and Lems. Robert Horne Ford Bombers wrap up the event sponsors evening and could add another name to the winner board. Robert Horne Ford Bombers have seen 3 winners in 7 races. Michael Soboski, Chaz Baca Jr and Justin Fitts all have wins on the season but Jason Knueppel who currently sits in second, Aaron Collier and Toby Wibeto will be gunning to pick up their first wins of 2018. Action begins at 7:30pm Saturday with grandstands opening at 5:00pm and pits opening at 4:00pm. Cost of admission just $15 for all adults, kids 11 and under are free. Pit passes $30 , kids 7-11 pit passes $15 and kids 6 and under free. Arizona Speedway is located within ET Motopark at 48700 N Ironwood Dr. San Tan Valley, AZ 85140 5 miles south of US60 on Ironwood Dr. Call the hotline or logon to www.ArizonaSpeedway.net for more info. 480-926-6688 . 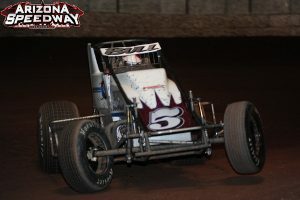 Follow us at www.Facebook.com/ArizonaSpeedway .